A Navigation Behavior (beNavigation) allows an Entity to avoid other Entities and obstacles. The Navigation Behavior is needed when using a Go To Behavior, but it can also be used alone for static Entities who need to react to others. 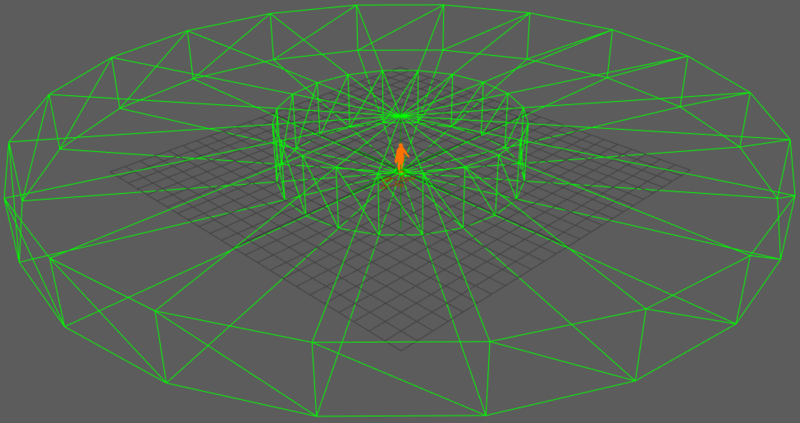 To use a Navigation Behavior, the Terrain Locator associated to the Crowd Manager must use a NavMesh. A Navigation Behavior defines the following specific attributes. For common attributes see Behavior Common Attributes. The Navigation Behavior relies on the Entity bounding cylinder, its Radius and Height parameters are set in the EntityType. Navigation Speed Max See the Random option of the Navigation Speed Mode described above. Available only when the Navigation Speed Mode is set to Random. Acceleration/Deceleration The maximum acceleration or deceleration allowed for navigating entities. The time it takes to do a 180 degrees turn. This parameter defines the maximum angular velocity of a navigating entity and can be used to facilitate (lower value) or make it more difficult (greater value) to turn. Extrapolation 1 : this avoidance algorithm tries to predict the future position of the neighbors of an agent based on their current position and speed, and then adapts the agent's speed and direction in order to avoid collision with surrounding entities and obstacles while still navigating towards a goal. Social Force 2 : this avoidance algorithm computes forces between an agent and its neighbors as well as the surrounding obstacles and changes the speed of the agent according to these forces. RVO 3 : this avoidance algorithm takes into account the reactive behavior of the other agents by implicitly assuming that the other agents make similar collision-avoidance reasoning. 1 [LamDon04] F. Lamarche and S. Donikian, "Crowd of Virtual Humans: a New Approach for Real Time Navigation in Complex and Structured Environments", 2004. 2 [HelMol95] D. Helbing and P. Molnar, "Social force model for pedestrian dynamics", 1995. 3 [BerLinMan08] J. Van den Berg, M. Lin and D. Manosha, "Reciprocal Velocity Obstacles for Real-Time Multi-Agent Navigation", 2008. This layout contains advanced parameters intended mainly for advanced users. Group Laxness Specific to groups. Determines the individual navigation behaviors of entities inside a group, how lax they will be in trying to keep the formation when avoiding obstacles, or other entities. See Set Formation. Determines the number of frames to wait before updating the navigation (1 meaning that the navigation is updated at each frame). Increasing this parameter also increases performance but the navigation will be less precise. Specific to the Extrapolation algorithm. Time interval in which the entity predicts other entities/obstacles position to calculate the path to avoid it. A low value of 1 sec for min and max, means the entity predicts the position of others 1 sec ahead. Obstacles Penalty Specific to the Extrapolation algorithm. Determines how far away from obstacles the entity will try to navigate. In other words it influences the distance at which the entity goes around the obstacle, a low value keeps it close to the obstacle and a high value keeps it far away. Specific to the Extrapolation algorithm. Determines how far aways the entity will navigate from other entities to avoid collision. In other words it influences the distance at which the entity goes around other entities, a low value keeps it close to the other entities and a high value keeps it far away. Repulsion Linear Factor Specific to the Social Force algorithm. It linearly increases the repulsion force. Repulsion Inverse Exponential Factor Specific to the Social Force algorithm. When this factor increases, the repulsion force increases exponentially. Body Force Linear Factor Specific to the Social Force algorithm. The body force counteracts body compression from neighbors. Friction Force Linear Factor Specific to the Social Force algorithm. The friction force reduces speed due to physical contact with neighbors. Rear Forces Linear Factor Specific to the Social Force algorithm. The linear factor applied to forces that don't belong to the awareness field. If set to 1 (default), the awareness field has no influence. Collision Penalty Specific to the RVO algorithm. It determines how far away from other entities the current entity will try to navigate. Increasing this parameter will make the entity try to stay further away from other entities. Its the penalty applied linearly to the minimum time to collision. 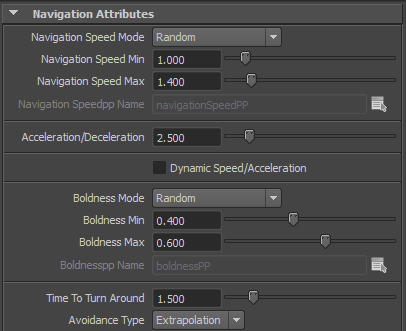 These parameters are specific to the Extrapolation and RVO algorithms. The two algorithms work by choosing the best velocity among a sample of velocities (the one with the lowest penalty). 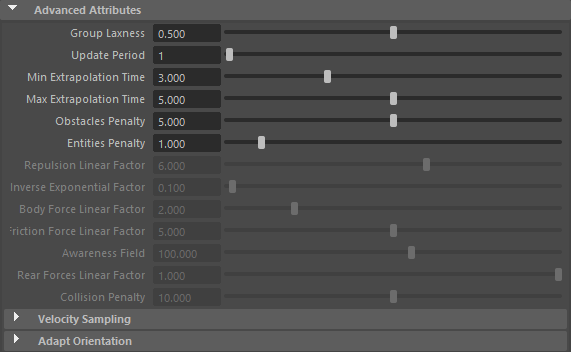 The samples are built with default penalties defined with the parameters below. Sets the preferences of the entity in avoidance. A higher Acceleration Penalty value than Deceleration will make the entities favor Deceleration to avoid other entities. Determines whether the entity favors right or left turn to avoid other entities. A higher value of Left Turn Penalty than the Right turn would make the entities favor Right turn during avoidance. Number of velocity samples used to compute the avoidance. Higher samples result in better avoidance but decreases performance. This layout contains advanced parameters for controlling Entities orientation adaptation. Use Automatic Orientation Enables/disables the automatic orientation of the Entity visual representation by the navigation behavior. If disabled the Entity visual representation will not be oriented by this behavior. Orientation Speed Threshold Speed threshold for adapting orientation. When the speed of the entity is lower than this value, its orientation is not adapted. Orientation Low Pass Filter Number of low pass filter samples for adapting orientation. It represents the number of frames used for smoothing the orientation corrections applied to the entities (it's used to avoid orientation jitter).